The 2014 season is here already. Shallot, Garlic and Onion seed are in the ground The last seeds and bulbs are in the ground. I have always used onion sets in the early spring. This year I’ll try to grow my own from seeds. They have emerged very nicely. The idea is to not give much room for each plant. Grouping the plants closely will make transplanting easier in early spring. I imagine we will dig up clumps and plant them in rows. Garlic is pretty easy to grow. In the southern US (Oklahoma) we plant in late fall, after the first frost. In a mild or normal winter they will emerge and grow 6 inches high. The magic is below ground where the cloves establish their roots. Garlic loves a rich soil so we have added chicken manure compost before tilling and hilling the soil. They like dry feet so raised beds are best. Plant each clove about 4 inches deep. 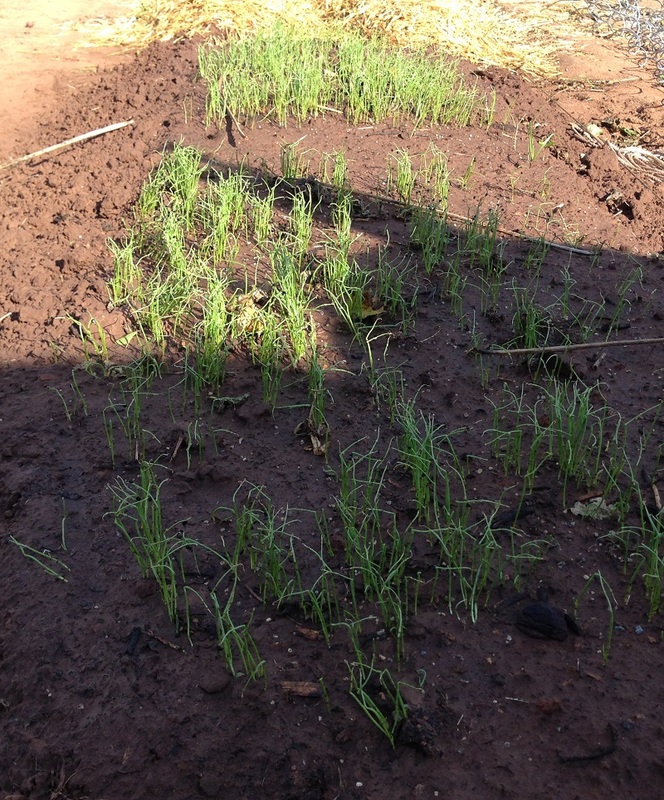 Next to the Garlic is a row of shallot. It is mostly French Red Shallot that I found at Southern Seed Exchange. They have a nice choice of varieties and cater to a southern gardener’s planting schedule. I have no trouble finding garlic nor shallot. I have until now always planted shallot in the spring. The result is shamefully small bulbs (some of which I have used as seed this fall). Maybe fall planting will finally produce a harvest of shallots. Thanks to Adrian the rows are now mulched with wheat straw that he shreds in a leaf shredder. He has also been busy building more compost piles from shredded okra, peppers and garden debris. We are getting loads of chicken manure from a new round of pullets. Ron Cramer gave me 24 chicks this summer and they have begun producing lots of eggs and poop. Plenty for the compost piles and about 2 dozen eggs per day. The garden is not sleeping. The first section planted in the garden in late 2012 were strawberries. To my surprise they produced some nice berries this year. Next year they should be great – if we can keep the deer out of the garden all winter. The Arapaho thornless blackberries have done very well too. This winter we grafted Brandywine heirloom tomatoes with a root stock variety called Colossus. The tomato grafting project is working. As you can see the result in these pictures. I waited too long to do the grafting and much of the scion (top) seedlings were to big to fit into the grafting clips. Next year I will be ready. Some of the grafts wilted and are dead. But less than 1/4 of the plants wilted. The German Striped are strong looking despite having poor grafting union. See the bottom right of the following picture. These are German Stripe. The rest are Brandywine. I hope to have enough Brandywine to do a good A/B test. I will plant 2 half rows (25 ft). 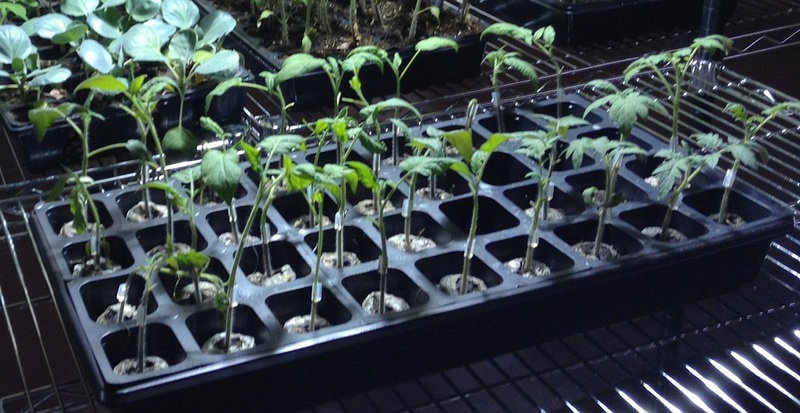 Half of regular Brandywine (A) and half of grafted plants (B) will be planted in these side by side rows. Each 1/2 row will have 15 plants. I hope to have a few for my smaller garden too. There I will do a smaller similar test on the German Stripes. In the background of this picture are the (A) tomato seedlings. They will have a big head start. Notice they are twice as tall as the grafts. I will also be able to plant the (A) seedlings on their side, burying most of the stems with just a few leaves above the soil. This helps the plant produce roots along the buried stem. The grafted seedlings (B) must be planted with the graft above the ground so that all the roots are Colosus roots. But this will not be as effective as planting it on its side. I hope this does not skew my test. Unless there is a frost in the 10 day forecast, these tomatoes will be planted in 2 weeks or about April 1st. After a bit of preparation, it is time to graft tomato plants. The seedlings are about 20 days old and some are already too big to graft. In addition to tomato seedlings, grafting clips and a razor, a healing chamber is needed. In this picture you can see my seedlings and lighting. Near the middle of this picture is a cart with seedlings on top and a healing chamber built on the lower shelf. 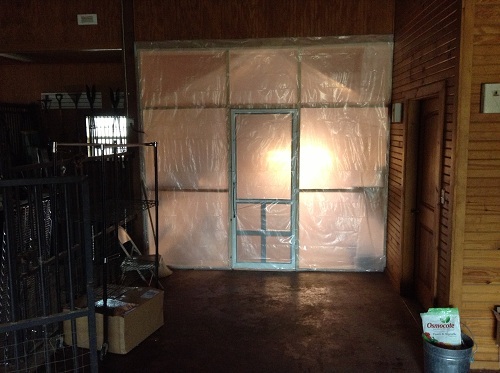 The chamber is wrapped in shrink wrap plastic to make a moisture ‘proof’ enclosure. This healing chamber is where the grafted seedlings are placed while the graft heals (3-7 days). To get a good graft, you first select plants with similar sized stems that will fit into the grafting clip.Brandywine and German Stripped are the fruit varieties I am grafting with Colosus root stock. I had plenty of good stem size matches. 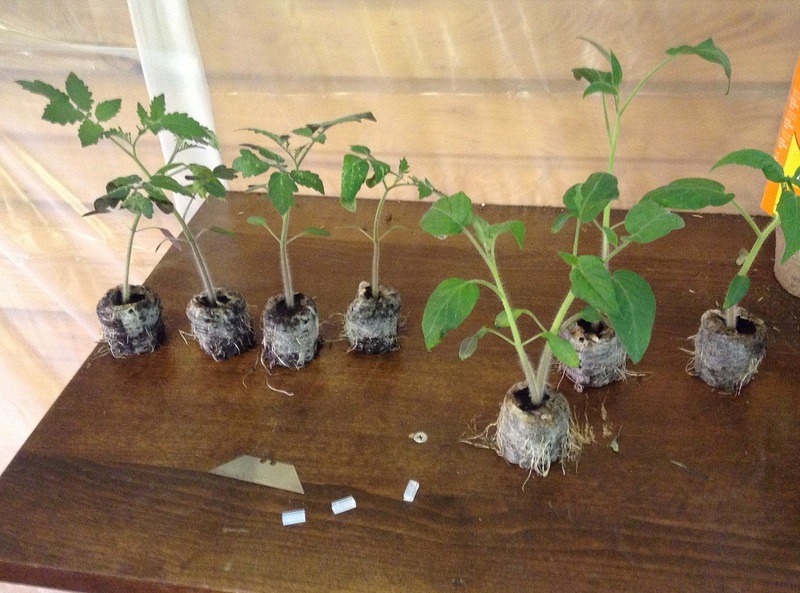 The top picture shows 4 Brandywine tomatoes ready for grafting. To reduce moitsure loss from leaves and to reduce the weight on the graft several leaves are also removed. The result looks very much like mutilation. Once several grafted seedlings are ready they are placed in a healing chamber. The chamber is kept at 80 degrees F and at 90% humidity. Too much water flowing through the graft is not good. The high humidity keeps leaf respiration low. Here are about 30 grafted seedlings in the healing chamber. It is kind of hard to see through the shrink wrap plastic, but you can see the plants inside. A heavy wet snow is falling, reminding me that plenty of time is left before real work begins in the garden. I was all up tight about my things to do in the garden. But now, seeing this snow fall, I am more at ease. I have about 8 flats of tomatoes, cabbage and lettuce started. Many of the tomatoes are to be grafted with Colosus root stock (which are also well started). The plan is to place about 15 grafted Brandywine tomatoes in one row and regular seedlings in the next row and have an easy comparison of yield. I have re-potted the cabbage into 6 packs. These will be ready for the ground in a week or two. So will the lettuce I’ve started for my smaller garden. In a week or two (March 1st) peppers can be started. And tomatoes will need grafting for some and re-potting for most. This is going to stretch my enclosure’s capacity to the max. My florescent lights can support 4 flats and the new metal halide light about 10 flats. The new 650 watt metal halide light is working well. I did attach a venting line to the light but it is not needed. The line is attached to a 6 inch fan, which is far too loud and far too much volume to just keep the bulb cool. I wanted to use the heat of the bulb as a second heat source. The snow is great news for our area. It is expected to be equal to about 2 inches or rain. We really need the moisture. The shelving arrived the other day so we could finish a seed starting greenhouse. The seed catalogs are full of great varieties. 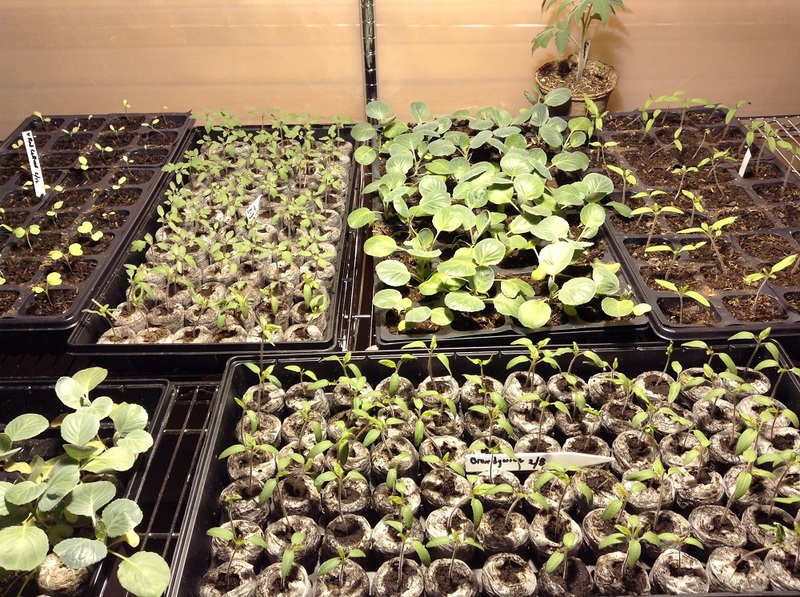 Starting plants from seed and growing them out to about 6 weeks is a way to garden in mid-winter. If you are like me the itch to garden is strongest in winter and even seeing small plants growing is satisfying. The spot we picked in the barn is perfect. It was a washing station for horses so it has water and a drain in the middle of the space. Below is a peek through the door at the potting station and water faucet. We used 4 mil plastic to form a vapor barrier. It will act to keep the humidity in the space and does help insulate too by forming a small air space between the wall and plastic. I also thought the condensation would form on the plastic and roll down the plastic on the walls and drip to the floor. I hope this will save the paneling. The rest of the space is for plants. More lighting will be needed for the racks on the left. These shelves, plus a 2′ x 4′ cart will accommodate 12 flats. The single shelf to the right can hold 4 more flats for seed germination of 300 or so individual plants. The rolling cart will be used to take the near ready plants outside to begin hardening them off. Scheduling the seed starting will be the trick, so that plants are ready for the garden when the weather allows and having ample room for all the plants we want to start. The black trays on the shelf are planting flats. They are perforated so 6 packs of plants can be detached easily from the flat. Each pot is about 2″ x 2″ x 2″. This is one of my favorite garden chores. Starting seeds in a coldframe or enclosure is the true beginning of a gardening year. This year we have built a nice 10′ x 10′ enclosure and just now getting shelving installed. 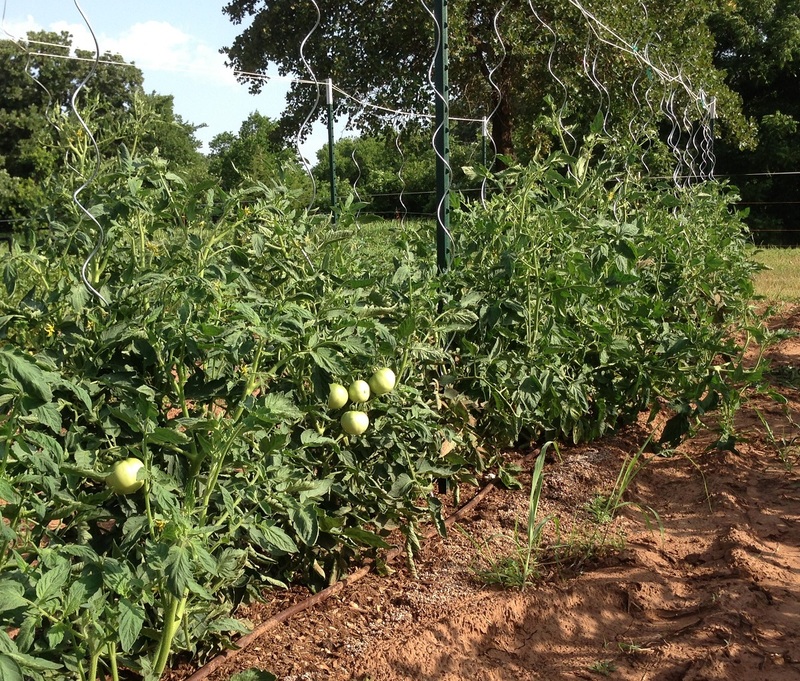 We will be starting lots of tomatoes, peppers and melons. Have planted (Jan 21) a few tomatoes for a grafting test. The diameter of grafted tomatoes must match well for the graft to take. So I have planted Colosus root stock and along with Brandywine and Striped German. If any grow more quickly then they will be planted later than the rest of the grafting stock. After 21 days, grafting can begin, so vigorous growth varieties will be slightly younger (18 days maybe). This will help keep all stems nearly the same diameter. Here is a link to Johnny Seed describing the process of tomato grafting. I am planning on a small test for tomato grafting. 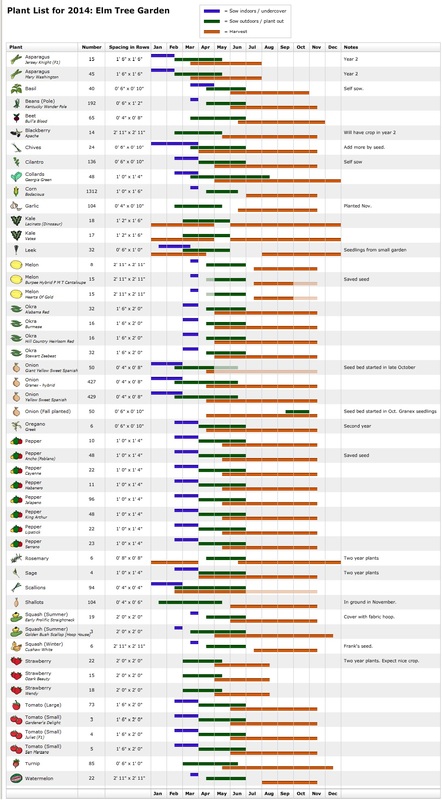 Will focus on heirloom varieties (Brandywine – 25 plants and 2 German Striped for easy comparison ). They usually have the least yield compared to hybrids. I am expecting a 50% mortality rate on the grafts too, so I will plant extra heirloom fruit stock than shown above.